Rapid virus database updates are available for the lifetime of AVG Free Edition, providing a high-level of detection capability that millions of users around the world trust to protect their PCs. AVG Free is easy-to-use and will not slow your system down (low system resource requirements). · Please note that any previous version of AVG Free will be un-installed automatically during the installation of the new AVG Free. · AVG Free Edition is available free-of-charge to home users! AVG Free Edition is for private, non-commercial, single home computer use only. 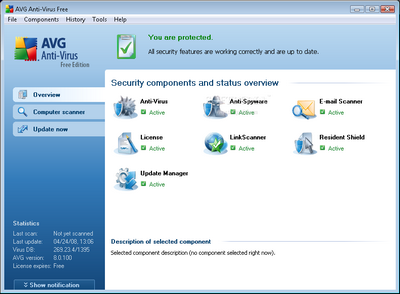 Use of AVG Free Edition within any organization or for commercial purposes is strictly prohibited. · AVG Free Edition does not offer advanced testing options, such as automatic healing, password-protected archives reporting, adjustment of scan process priority and many others.